R.P.E. 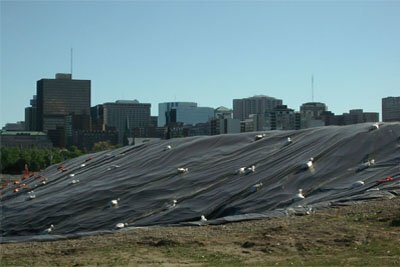 geomembranes are lightweight multi-layer materials which offer a very economical solution in many primary containment applications, such as temporary landfill caps, canal lining, soil remediation and other non-hazardous applications. R.P.E.s remain flexible in very low temperatures, have good chemical resistance and short-term UV resistance, allowing it to remain exposed for three to five years. The inner layer is typically a pre-stressed woven polyethylene tape, coated on both sides with an impermeable LDPE (low density polyethylene).